I love, love, love this idea!!! No horrible expensive chemical air/carpet fresheners for me anymore! This little project is one everyone will want to make! 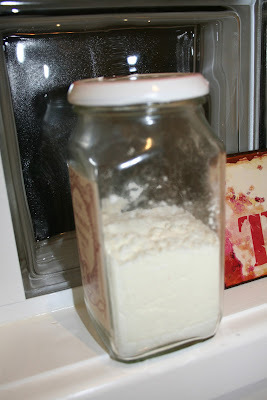 Supplies: Glass jar with lid, something sharp to pierce the lid, baking soda, favourite essential oil, spray paint. Optional - gorgeous vintage label. First clean out your jar. I used a Leggos sauce jar. Spray paint your lid white. After it has dried, scratch off a bit off the paint around the top rim of the lid to give it an aged effect. Fill your jar with baking soda and about 10 drops of your favourite essential/fragrant oil. Put the lid on and shake the jar to mix. Baking soda is also useful in absorbing unpleasant smells. 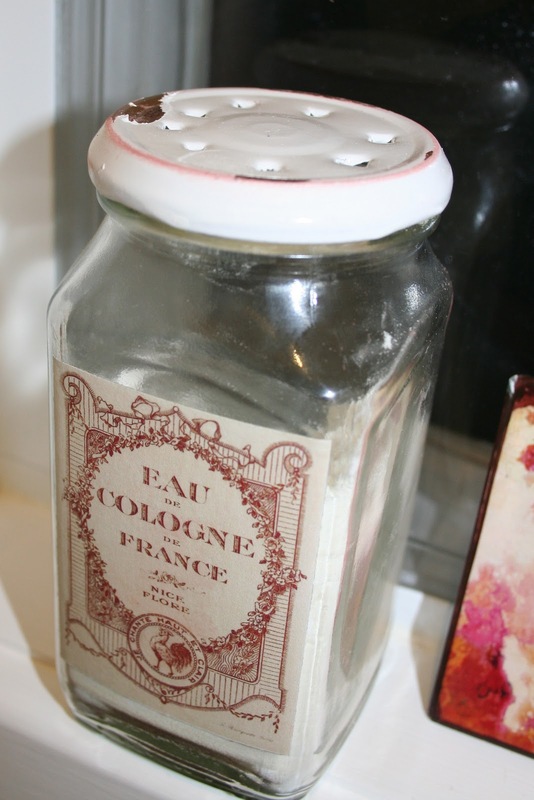 Take the lid off and punch numbers holes in the top to allow the fragrance to dispel. Print a gorgeous vintage label and attach with glue stick, then coat with Modge Podge. Mine was intended for the bathroom, but the jar is just a bit too big for the ledge. This one will find a home in another room. In fact, this idea is perfect for any and every room of your house. AND it doubles as a carpet freshener! Simply shake some of the baking soda out on your carpet, allow to sit for 10 minutes and then vacuum. Your house will smell divine! When you have finished all the baking soda mix, you can top if up with a different fragrance if you like. And if you don't have any jars, a nice bowl would also work fine.